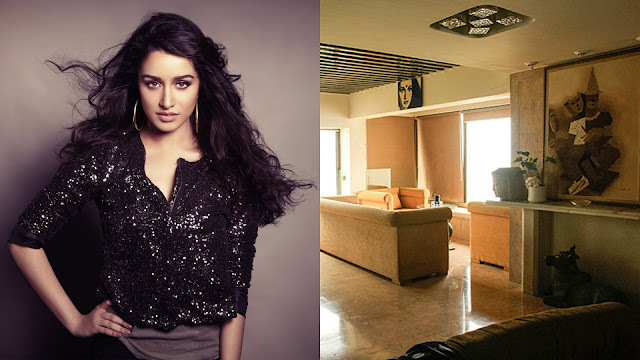 Bollywood actress Shraddha Kapoor lives in a sprawling house on Juhu beach, a posh Mumbai locality. Shraddha Kapoor lives with her father Bollywood actor Shakti Kapoor, mother Shivangi Kapoor & brother Bollywood actor Siddhanth Kapoor. Shraddha Kapoor father Shakti Kapoor bought his first house -- a one-bedroom apartment in Juhu -- for Rs 70,000, five years after he arrived in Mumbai. After seven years, Shakti Kapoor bought his second house -- a three-bedroom apartment, in which he lives today, for Rs 7 lakh. He took a loan from Shyam Shroff, the owner of Shringar Films. After he married Shivangi, he bought the adjoining flat. After Siddhant was born, he bought another flat on the same floor. Today, he owns the whole floor. Shraddha Kapoor was four years old when she starting playing the piano. But Shakti Kapoor had heard her sing in the house and did not realise she was so talented until he heard her sing Galliyan, a song from her film Ek Villain. It was Jeetendra who advised Shakti Kapoor to buy property. Shakti Kapoor was fond of cars, and liked to buy them. But Jeetendra told him to respect money and not waste it on cars. Today, Shakti Kapoor has a house in Juhu, a house in Madh Island (in the city suburbs), a house in Lonavala (a hill station near Mumbai) and a house in Greater Kailash, Delhi. The furniture in Shakti Kapoor's home is 30 years old. The house has beautiful paintings and pieces of architecture, selected by Bollywood actress Shraddha Kapoor mother Shivangi Kapoor.